Japan Airlines finally unveiled its Doraemon Jet today at Haneda hanger. JAL will start flying the Doraemon Jet from Monday until the end of April. The JAL Doraemon Jet is a Boeing 777-300 with registration number JA8941. The same plane has been used for a few other special liveries before, e.g. the Oneworld Livery, which you can check it out on airliners.net. Mainichi Daily News has a very nice photo album of today's event. 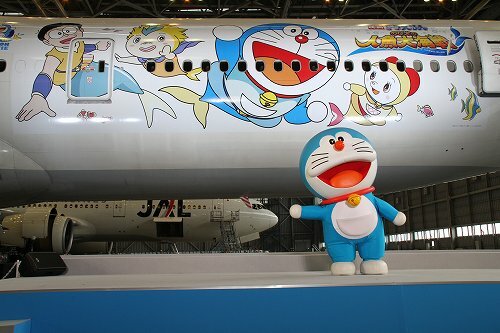 You can look at the Doraemon Jet and how happy the kids were here. Below are some video news coverage of the event.